About the Simple Homestead Blog Hop #193! The Simple Homestead Blog Hop #193 runs from Thursday morning to Sunday evening, so spread the word and spread the love. Share your best material and check out someone else’s best material, too (maybe leave a comment letting them know you found them here at the hop!). Be sure to follow your hosts to let them know you’re here, as well! Personally, I love to use blog hops as a source of pinning material for Pinterest. I find a few posts that I really love and pin away! First, let’s meet the blog hop hostesses! Simple homestead, style! Be sure to grab your “FEATURED” image below! Just right click and copy or download! Family friendly posts only, please. 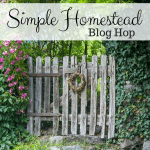 Share up to 3 posts on The Simple Homestead Blog Hop. If you would, please visit other bloggers and let them know you found them here. Also, you can follow us by email and receive notice when the hop is open for business.